Lewis Hamilton has tied Michael Schumacher's record of 68 pole positions. 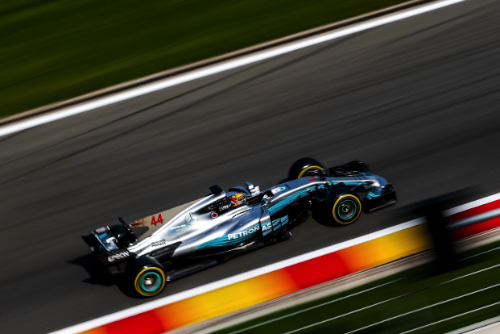 Fittingly, Hamilton earned pole number 68 at Spa-Francorchamps, the track where Schumacher enjoyed so much success, during qualifying for the Belgian Grand Prix. "It's one of my favorite circuits," Hamilton said. "To come here and put a lap together like that is a dream." Raikkonen had been the fastest of the weekend so far with his time of 1:43.916 set in FP3 using Pirelli's ultra soft slicks. Two drivers would have grid penalties. Massa 5 places for ignoring the yellow flags during FP3. And Vandoorne 65 places for a myriad of power unit changes. Vettel, who had just signed a new three-year deal with Ferrari, set the early pace with a 1:44.275 on the super soft tires. Hamilton beat that with a 1:44.184. While the Mercedes and Ferrari drivers used the super softs, the rest of the teams went straight to the ultra soft compound slicks. Once the drivers had done their first laps, Massa was 15th and on the cutoff line. Grosjean was 16th and Sainz was 14th. Out front, the order was Hamilton, Vettel, Verstappen, Raikkonen, Bottas and Ricciardo. While the top drivers remained in the garages in the closing stages, there was plenty of action elsewhere. When it was over, the five drivers who were eliminated at the end of Q1 were: Massa, Kvyat, Stroll, Ericsson, and Wehrlein. The fastest 15 drivers who moved on to Q2 were: Hamilton, Vettel, Verstappen, Raikkonen, Bottas, Ricciardo, Ocon, Hulkenberg, Sainz, Vandoorne, Palmer, Magnussen, Perez, Alonso and Grosjean. Hamilton was the first out in Q2, and he was on the ultra soft tires. Everyone else would use the same compound. He posted a 1:43.539, beating Raikkonen, Bottas, Verstappen and Vettel. Ricciardo, Palmer, Ocon, Perez and Alonso rounded out the top 10 after the first runs. Hulkenberg was 11th and just outside the cutoff ahead of Magnussen, Grosjean, Sainz and Vandoorne. Once again Hamilton was the first out as the drivers did their last runs. He improved to a 1:42.927. The five drivers who were eliminated at the end of Q2 were: Alonso, Grosjean, Magnussen, Sainz and Vandoorne. The fastest 10 drivers who moved on to Q3 were: Hamilton, Bottas, Raikkonen, Verstappen, Vettel, Ricciardo, Palmer, Perez, Hulkenberg and Ocon. Q3 lasted 12 minutes. You know who was first out on track, but it was Raikkonen who clocked the first lap with a time of 1:43.270. Palmer's hopes came to a smoking end as he parked his Renault with no gearbox oil pressure. Then Hamilton rammed in a 1:42.907. Raikkonen was second ahead of Bottas, Vettel, Verstappen and Ricciardo. Palmer, Perez, Ocon and Hulkenberg did not record times. And so it was on to the final laps of qualifying. Hamilton improved to a 1:42.553 to win pole number 68. Vettel improved to take second ahead of Bottas, Verstappen, Ricciardo, Hulkenberg, Perez, Ocon and Palmer.